When everyone reads together, literacy wins. Get a more complete picture of early literacy. Learn how you can assess oral reading fluency, comprehension, and foundational skills for an entire class in just 20 minutes: MAP Reading Fluency. Do you know who creates strong readers? We do. Every time school community members model reading, they influence students to be readers, too. Launching a school-wide fluency challenge in the primary grades could be the game-changer you need to build literate students. Modeling fluency is a key component of strong reading skills. But fluency is not just about reading more quickly. Rather, fluent readers use a combination of skills every time they read. Setting up a school-wide fluency challenge at your school can help teachers assess fluency while readers practice it with authentic purpose. Start early in the year. The earlier you intentionally engage all reading components, the more likely it is that students will incorporate important aspects, like fluency, into their regular reading experience. Keep it going all year long. Keeping students aware of their fluency growth throughout the year builds confidence and understanding. It also helps generate a respect for process over product. Make sure everyone is involved. Leave no stakeholder out by including everyone from the food service staff to the grandparent volunteer. Practicing reading can be done with anyone, anywhere. Step 1: Define fluency for your school. First, define what fluency means for your school so that everyone uses the same language and looks for the same indicators. Fluency includes three skills: accuracy (reading the words correctly), automaticity (recognizing the words quickly), and prosody (saying the words with intonation and rhythm or expression). Next, define the challenge as one where everyone can be successful. This is a school-wide challenge that is individually driven. In this challenge, if everyone makes even a small gain, it’s a win. Fluency growth is personal. 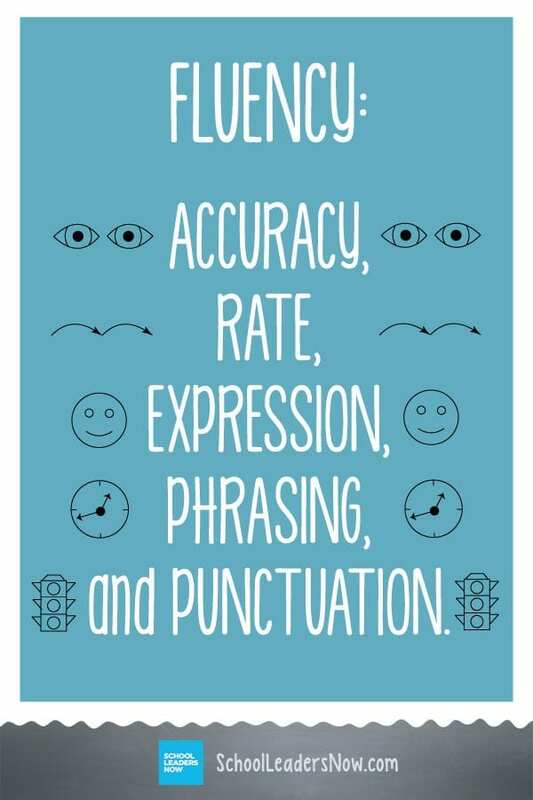 Share these fluency definitions with all students and teachers and have them make personalized posters as reminders. Send home small versions of the posters so that parents use the same language. Step 2: Model fluency practice all over the school. Students expect to practice fluency in the classroom, but what about in the lunchroom, the library, the principal’s office, or even during PE? Think of out-of-the-box ways to practice the three components of fluency. In PE, words could be written around the room, and kids could practice saying them accurately as they run by them. With the addition of punctuation, kids could even read the alphabet with intonation, which gives them the opportunity to practice prosody. If kids finish lunch early, they might go to a fluency corner to grab a readers’ theater script and practice while they wait for lunch to end. Music class is a great place to practice fluency because we expect fluency when reading and singing music. Step 3: Identify what fluency looks and feels like in the reading process. It’s hard to know if you’re getting better when you don’t know where you’re going. Tim Rasinski, professor of literacy education at Kent State University, has developed a rubric that can be helpful in identifying where a student should go next. How many words per minute are kids reading now? Are they reading word by word or in three- to four-word chunks? What is each student working on and are they able to articulate their goal when asked? Understanding how fluency is a building block to reading comprehension is important. Strong readers know when to speed up, slow down, or use different intonation. Fluency is not a reading goal but a part of the whole reading process. Step 4: Set up informal assessment stations. When kids know their own fluency stats, they also know when their work has paid off or when they need to work more. Set up informal assessment stations that include levelled text passages, whisper phones, recording tools (pencil and paper or iPads), and timers. Students can read passages and time themselves or have someone else time them. Kids love to test themselves, and this helps them see how much control they really have over the end result of a learning challenge. Teachers can assess quickly, too, when they use a program like MAP Reading Fluency. This kind of a program can also help you assess and track fluency—as well as comprehension—after the challenge. Step 5: Value the whole reading process. Making progress and putting in effort will make the difference in a school-wide program. Students need constant reminders that show them how much time they put into reading practice and all the parts involved that will be rewarded. Fluency is about reading at an appropriate rate and with an intonation that sets the reader up for good comprehension. 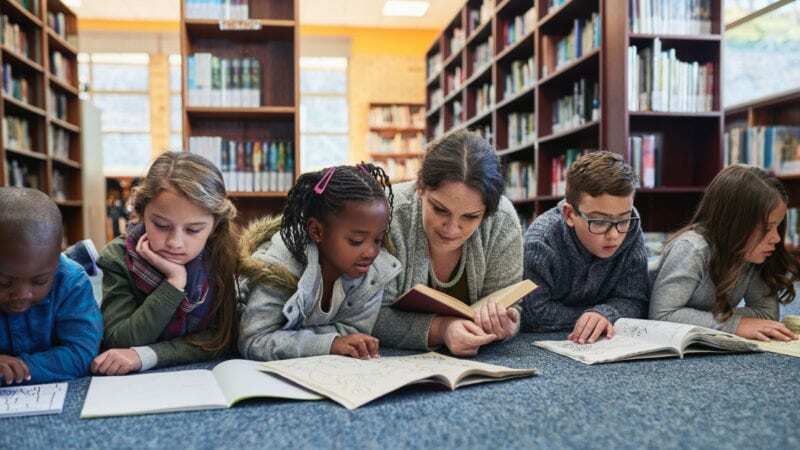 Set up individual milestones that can be rewarded with bookmarks, free books, or time spent reading with a beloved adult at school (the principal, special teacher, or lunchroom staff member). Keeping the rewards easy to distribute and book-related keeps the focus on what matters most: reading.